It’s that time of year, everyone is getting ready for summer! Flip flops, shorts and bathing suits! If your legs and feet are dry from a cold winter, a Body Polishing Scrub may be just what you need! If you’ve been working in your flower beds or garden and have ground in dirt all over your hands and arms, a scrub has enough grit to help you get cleaned up quick and easy! Keep a jar near the sink! Our scrubs gently exfoliate dry skin leaving polished smooth skin. They also moisturize the healthy skin left behind. Scrubs may directly or indirectly stimulate nerves, which may help to promote healthy blood flow and even a relaxed peaceful mood. Our scrubs are made with a mix of high quality salts & sugars; Pink Himalayan salt, Celtic Sea salt and pure cane sugar to name a few. Sugar is a mild alpha hydroxy, helping to encourage dry skin turnover & generating fresher younger looking skin. Himalayan Pink salt is one of the purest salts available, naturally rich in 80+ nourishing and skin replenishing minerals for a therapeutic bath/shower experience for mind & body. Real salt is all natural mineral rock & sea salt, a combination of over 60 minerals, including calcium, potassium & magnesium. Epsom salt is perfect for giving your body a magnesium boost. We use certified organic oils & butters such as raw coconut oil, olive oil, shea butter and mango butter. These help to seal moisture in to your skin without having to use lotion after your shower or bath. Coconut oil is used in soaps for it’s cleaning properties so it serves as a dual purpose. Raw clover honey, local to Southern Lancaster County (where we are located), is in a few of our scrubs. Honey is packed full of vitamins, minerals & enzymes that are particularly useful and nourishing for your skin. We use enough honey to reap the benefits but these scrubs do not leave your skin sticky. As with all of our products, we use pure therapeutic grade essential oils. These oils are organically grown, harvested and processed. Attention is paid to harvesting at the right time and distillation times precise for essential oil perfection. Our Hike In the Woods Scrub is our first scrub to have organic flowers in it, Lavender & Rosehips, we are planning more! Flowers we use are always organic, some are grown in our gardens, some are purchased locally. We do not use any preservatives, they are one of the most toxic ingredients in commercial products. Due to this, the life of our Body Polishing Scrubs depend on using dry hands or a dry utensil to scoop out. Our scrubs come with a bamboo fork or small spoon, depending on size ordered, perfect for scooping. Allowing water to sit in it will reduce the shelf life drastically. We recommend using our scrubs within 6 months of opening, for maximum benefits from all ingredients. With regular use, every few days, a 9 oz jar of scrub lasts a couple weeks. Body Polishing Scrubs are for use in the bath or shower. Apply scrub on body, paying special attention to areas of dry or itchy skin. Our salt & sugar scrubs work wonders for dry foot care! 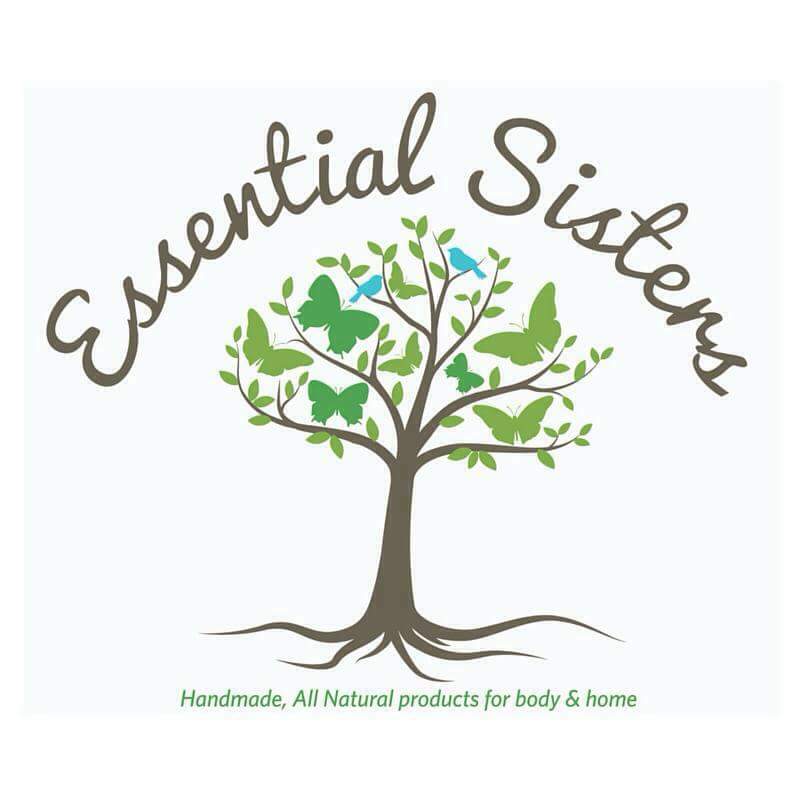 Essential Sisters Body Polishing Scrubs come in a 9 or 4 oz glass jar, they vary in net wt though as all scrubs weigh a little different based on ingredients. All scrubs have the net weight listed on the label and in their descriptions on Etsy. Different sizes are available for special request. These jars are glass and because we do not use any toxins you can wash them when empty and reuse around the house. If you have any questions about our Body Polishing Scrubs or any Essential Sisters’ products, please message us. ~Follow our Facebook, Instagram or Pinterest page(s) or Etsy store. Receive 1 entry for each followed. Leave a comment here that you have done so, or already do! ** This giveaway is not affiliated with any social media sites. ~All orders placed using the coupon code below will receive 1 additional entry. Winner will be chosen randomly on Monday, May 9, 2016 at 9:30 AM. We will post the winner here and on our social media sites listed above. We are offering 10% off all orders placed between now and Saturday, May 7, 2016. Use code “LetsCelebrate100” on Etsy or mention it if placing an order through message. Next Summer is for herbal gardening.